Dr. Mitchell is a local, growing up in Moorestown, NJ. She attended Gettysburg College, majoring in Environmental Science. 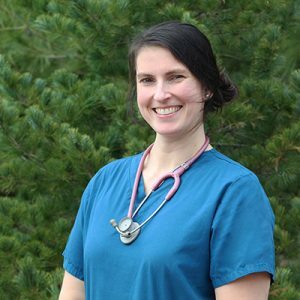 She lived and worked in Washington, DC as an environmental scientist for 2 years prior to starting her career in veterinary medicine. She worked as a veterinary technician while working on her masters in Laboratory Animal Medicine in 2010. She took a big leap and decided to move to Scotland to complete her veterinary degree from the University of Glasgow in 2015. Her professional interests include dentistry, preventative medicine, feline medicine and palliative care. In her spare time, she enjoys spending time with her husband, chasing around her twin toddlers and snuggling with her two foster fails, Mr. Harry and Bella. Dr. Mitchell and her husband are extremely interested in traveling and like to visit at least 1-2 places a year they have never been before! Even though she has been practicing for 4 years, Dr. Mitchell is new to mobile practice but is extremely excited to be able to treat the whole patient, see where they live and the true environment in which they live.